Plan B’s 2nd album, 'The Defamation Of Strickland Banks', wrong-footed the entire British music industry. His metamorphosis from gritty cult London rapper to a Brit award-winning mainstream artist was outstanding. It is equally remarkable that with only a fledgling acting career he has written and directed his first feature length film, 'Ill Manors'. Centred on London’s underbelly of disaffected youth and violence, Plan B – real name Ben Drew - has “Broken Britain” in his crosshairs. This is not for the faint hearted. 'Ill Manors' weaves six storylines together, predominantly focusing on dealers Aaron (Riz Ahmed) and Ed (Ed Skrein). After a police sting, Ed’s phone goes missing and Aaron accuses crack addict Michelle (Anoushka Mond) of thievery. What follows is an exploration of gang brutality, drug-running, traumatic upbringings and premature sexualisation. Plan B does not shy from experimentation, introducing each protagonist with hip-hop laden narration, colouring their backgrounds through the gifted lyricism that won him an Ivor Novello award for best songwriter. Edited artfully, this mechanic thankfully steers away from becoming a series of music videos. The film is pulsating. The pacing is brilliantly dictated and boasts a slick soundtrack. Notably, 'Ill Manors' is full of contiguous scenes, leaving the audience unsettled as to the alignment of each story in the overall timeline. Elsewhere there is use of stop-motion, camera-phones (remember happyslapping?) and SnorriCams. Grotty estate colours of concrete by day are overlaid by saturated colours of the London at night. Plan B gives plenty of stylistic nods to Gaspar Noe, Quentin Tarantino and Darren Aronofsky. Unfortunately, the film‘s muscle is weakened on two accounts; the handling of multiple narratives and the effectiveness of the message against David Cameron’s “Broken Britain”. With so many tales being told at once, there is a messy overuse of coincidences to build to the crescendo. The jumbling of narratives may leave you feeling as drug-addled as those on screen. Secondly, the glorification of and desensitisation to violence amongst ‘Laandan yoof’ culture is rationalised by the severely troubled environments and childhoods of each person. Whilst trying to humanise sometimes seriously inhumane behaviour, there is neglect of another critical aspect –the people raised in similar impoverished and traumatic circumstances who prevail to become contributing members of society. 'Harry Brown', a film Plan B starred in, does a more subtle and effective job of addressing the entire ecosystem of the capital’s vulnerable communities. In the same ilk as Noel Clarke’s 'Adulthood', there is huge potential here for Ben Drew to be the cinematic conscience of London’s underrepresented youth. 'Ill Manors' is poignantly timed as we near the 1-year anniversary of the London Riots. The directorial innovation and bravery with a largely unknown cast deserves applause. Several moments are heart-pounding and create squeamish tension. Unfortunately the honest reflections on the ills of his urban jungle are overshadowed by the gratuitous extremes of the drama. What 'La Haine' did to re-energise French political discussion of youth in the “fractured” suburbs, 'Ill Manors' lacks in substance to achieve in the UK. 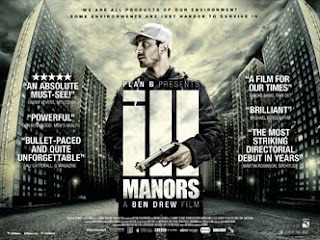 Nevertheless, 'Ill Manors' is an assured debut from Plan B and certainly merits a watch. 'Ill Manors' is released on 6 June in UK cinemas through Revolver.